If you are reading this, chances are you and/or your child are interested in being creative through drawing. Humans have engaged with the practice of mark-making for a recorded 60,000 years plus. It’s a natural, valuable yet sometimes underrated process. From the pre-historic cave paintings to the more current adaptation of digital technologies; using lines and shapes to create form still remains as one of the most intuitive and sophisticated ways for humans to communicate ideas. Comparing a toddler’s random scribbles to ancient Gwion Gwion (Bradshaw) cave paintings and more ‘modern’ Da Vinci style masterpieces… each drawing brings with it its own unique qualities, purpose and intention. Whether for fun, story-telling, careful observation or perhaps therapy; the purpose and act of drawing has its own benefits…of which are a separate thesis ‘or two’ in themselves. 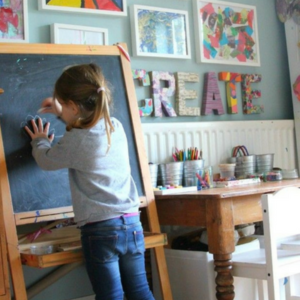 With a little thought and organisation, encouraging your child to express themselves through drawing at home (no matter how simple or complex) is not only achievable but can bring enormous rewards to you and your child. Finding a quiet ‘nook’ or surface in your home has benefits in many ways. It allows your child a calm area to default to when feeling overwhelmed and can give them a sense of belonging within your home. Simplicity is the key. A small bench or table works well and if you have something transportable ‘moving’ outside on a sunny day can spark interest and enthusiasm. 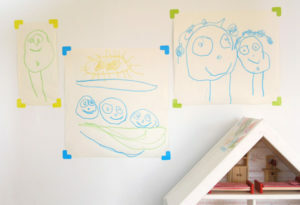 Allow your child to decorate their space with a few objects or images they love. Hang fairy lights or pick autumn leaves from outside as inspiration. Importantly, allow the space to evolve as your child’s interests do. Creative spaces can be so much fun to design. Image from The Imagination Tree and The Art Pantry. Drawing Materials: There is a huge variety of materials on the market but it doesn’t need to be complicated. Having a basic supply of good quality materials accessible to your child will help them to feel successful with their drawing. Be selective with the items you put out and allow your child to explore the medium wholeheartedly. Explore drawing on different types of paper, cardboard, and boxes. Try oil pastels on baking paper, painting with Q-tips on alfoil, glide a stick through sand or polenta in a tray. 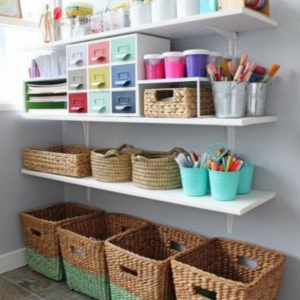 With preschool and older children, have materials easily accessible. This will encourage them to work independently and (hopefully) help them with the process of packing up! Buy or make a sketchbook to travel with. 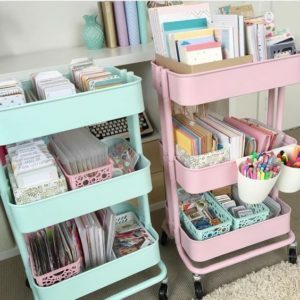 Love this idea from Creative Work-space with Ikea Trolleys. Ideas and Inspiration: Children will naturally make marks using tools from a very early age. Most will draw from their imaginations while they make sense of the world and develop their fine motor skills. Inspiration will vary for each child and may come from a favorite toy, or book they have read, a shape they are mastering or perhaps even a song they like. Collect, trace and observe shapes from nature or around the home. See if you can ‘break down’ objects into simple shapes and for reluctant drawers try adopting artist Paul Klee’s saying of “taking a line for a walk” to see where it leads. Play games like ‘Pictionary’ or ‘roll the dice’ to get things started. Visit a local gallery or for older children use the internet together to explore artists and images. Language and Feedback: Not all of us are natural born artists and like any skill set drawing is one that takes time to develop. With this in mind, resisting judgement around you and your child’s drawing can sometimes be challenging. Firstly, be kind to yourself and your own abilities. Practicing positive self-talk and ‘making mistakes’ in front of your child acknowledges the process of risk-taking and problem-solving that is part of the creative process. Allow your child time to point things out, perhaps help them to write words or a story to go with it. Ask them to describe their feelings when they were drawing the picture. Use statements or questions like: “ tell me about your picture” or “what is your favorite part?” Acknowledge all attempts of mark-marking, particularly with young children as they develop their fine motor-skills, explore new mediums and develop spatial awareness. 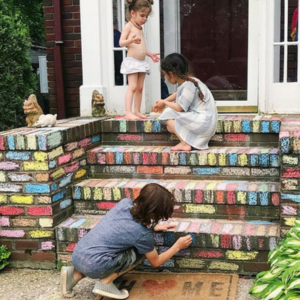 Chalk outside is the most amazing fun, great ideas from The Workspace for children. 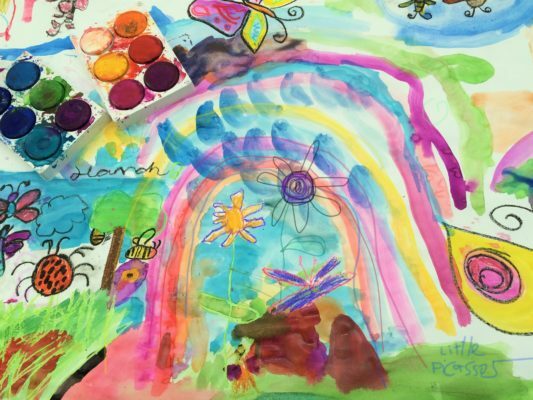 Storage of Finished (and un-finished ) works: Celebrate your child’s drawing! Displaying your child’s work will boost their confidence more than you know and the options are endless. Use coloured paper to back pictures, frames, pin up boards, hung string and empty walls/windows- all valuable spaces ready for a splash of life! Keep a scrapbook or shoebox of memorable pieces for the child to revisit and if you have space collate drawings using large plastic sleeves or envelopes. Not every drawing is going to be a masterpiece but you and your child will love looking back at the progression of work that has been lovingly created over the years!